It’s funny; this wasn’t the day that was supposed to matter. For months, we’d drilled it into our minds and the minds of anyone who would listen that the 25th was the big day. And, of course, the 25th was a big day, a huge one- but the 26th was the day we would finally know. The day we would finally be able to look each other in the eyes and know that we felt the same way: safe. The night before, I’d come across a quote: “Don’t fear death, fear the state in which you will die”. I’d seen a joke in response to it that said “I’ve always feared Ohio”, which was funny on its own but, for an Irish woman, also literally hit home. Fearing the state in which you will die can meet a lot of things. Perhaps you don’t want to die too young, before you’ve accomplished your most precious goals, or due to some preventable reason. These are the states most people fear dying in, not the State that is supposed to be their home. Until 26th May, a lot of women were afraid that Ireland was the State they needed to fear. If they became pregnant and a health issue threatened their life, the State they were in would have more of a say in their survival than they would. In the months and years leading up to 26th May 2018, we had come together to remember the women who had been in the exact situation we feared; Savita Halappanavar, Miss X, and all the women whose stories and lives had been hidden from us. We promised ourselves and each other that Irish women wouldn’t have to endure this much longer. We promised those we remembered that we would fight for the safety they should have been given. So, we fought. We fought for the women whose lives were endangered. We fought for the women who had become pregnant against their will. We fought for the women who would be denied medical treatment because of their pregnancies. We fought for the twelve women every day who left the country to get the abortions they couldn’t get here. We fought for the women who felt alone in one of the biggest decisions of their lives, a decision they had to hide. We fought for the women who didn’t want children, weren’t ready for them, and all the women who were told they weren’t a good enough authority on their own bodies to make that decision. We held rallies. We signed petitions. We marched through the streets holding signs and wearing badges. We listened with broken hearts as misinformation and malice were spread by the opposition, as we were verbally abused by some and got nothing more than an eye-roll from others. We spoke to compassionate people on both sides and waited for the loudest and most hurtful to finish their points so we could get a word in. Unfortunately, they had a habit of repeating themselves and shouting so we couldn’t do that. So we shouted back, as is sometimes necessary. Then came the backlash of “you’re not hearing them out, everyone’s entitled to their opinion”. It took a long time. It took strength, patience, love, and anger. We stood by each other, we flew home from around the world, we held hands and waited, desperately hoping that our country would see that it was time for change. We held our breath, allowing the tears to silently stream down our faces because we couldn’t keep them in any more. You can only hold in so much. I was glued to the TV on 26th May. As the results came in from each constituency, I could see it adding up to a “yes” and I was hopeful, but something in the back of my mind wouldn’t allow me to celebrate until there was no chance whatsoever of the result being overturned by the last few numbers. 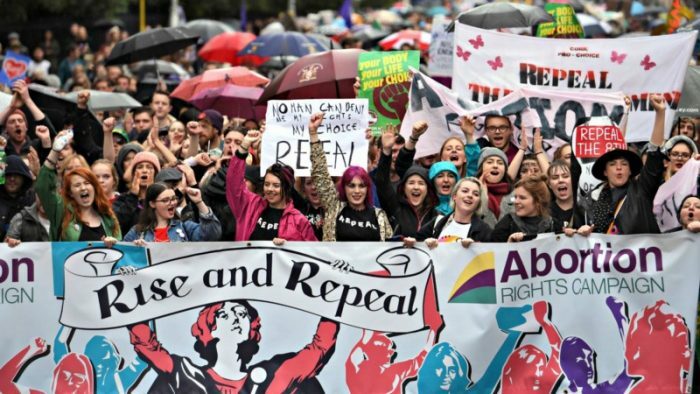 I was clinging to my movie-magic idea of hearing the words “The Eighth Amendment has been repealed” from Dublin Castle at 5pm, but that’s not how these things work. By 5.45, we were still waiting to hear from three constituencies. Three constituencies weren’t going to change the result, but I still couldn’t let go. I was still afraid it would be ripped away from me. So I went outside and joined the crowds; it was only when someone checked their phone and said all the votes were in that I could relax. I didn’t get that moment I’d expected because that’s not how life works. It was more in line with Leo Varadkar’s words about the culmination of “a quiet revolution”. This change wasn’t something that happened in an instant, it was something that had built over time and shown us that all of Ireland believed in this new idea. The years of this campaign, the decades of unrest before it, the bitter arguments in the previous months and the pushing for a society that our women deserved had all culminated in this vote result that was finally announced on 26th May. We’d repealed the 8th. We did it. Our bodies are now our own. We don’t need to fear the State we die in any more.